Whether you need power in an outage or during a camping trip, your generator's likely to face tough weather situations. If you primarily use your generator for emergency backup power, you need to take it outside during a storm. While you're sitting inside, warm and dry, your generator's exposed to the elements. Why not give it some shelter as well? GenTent generator canopies are a great way to protect your generator in some of the worst weather situations. You may have a steel enclosure, a plastic shed, a pop-up canopy, or other make-shift structure for protecting your portable generator. One major benefit GenTent has over all of those other options is that it's mobile and non-restrictive. The GenTent attaches to the generator itself and doesn't make contact with the ground. This means you can roll your portable generator wherever you want it without having to remove the GenTent. All sensitive components are optimally protected without restricting access during use. Outlets remain dry, regardless of weather. 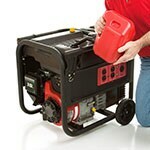 Even with hurricane and blizzard force precipitation, the GenTent keeps your generator safe and dry. Unlike other canopies and shelters, the GenTent allows unrestricted ventilation and air flow. The fresh air intake isn't blocked by the cover, so you know your generator's motor won't be choked out. Heat generated by the motor can naturally radiate and vent, so overheating becomes a concern of the past. GenTent has custom designs for over 1,000 different generator makes and models. The canopy itself is really one-size-fits-all due to its fully adjustable clamping or strap-based mounting methods. There are various mounting methods for a custom fit on almost any portable generator. The mounting methods create a perfect fit across a wide variety of generator sizes and shapes. 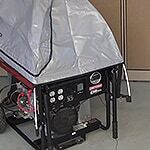 However, GenTent canopies are not recommended or designed for open-top generators that have their muffler positioned at or near the top of the unit where the muffler heat could collect inside the canopy. Use the tool below to find the perfect GenTent for your generator, and rest assured that your generator will survive the storm. 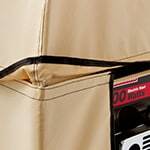 Currently we don't offer a matching tent product for your generator model. Please click here to order directly from GenTent's Website. GENTENT CANOPY BENEFITS: An Innovative Way to Shelter Your Generator. The Generator Experts at Electric Generators Direct explain the benefits of using a GenTent generator canopy. Find out what makes GenTent the best option for protecting your portable emergency generator.